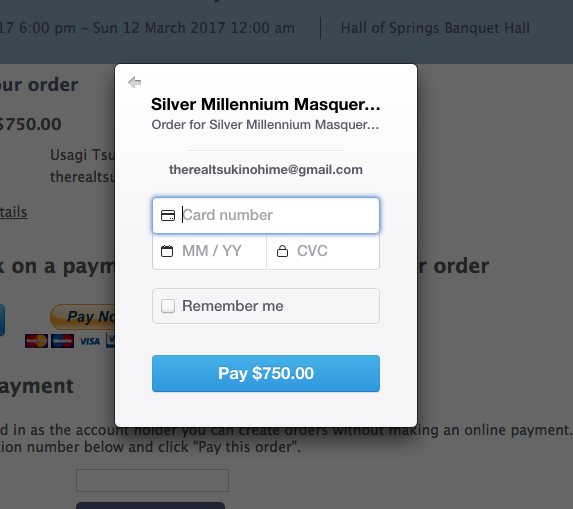 On this page you’ll enter the quantity of tickets you’d like to purchase. 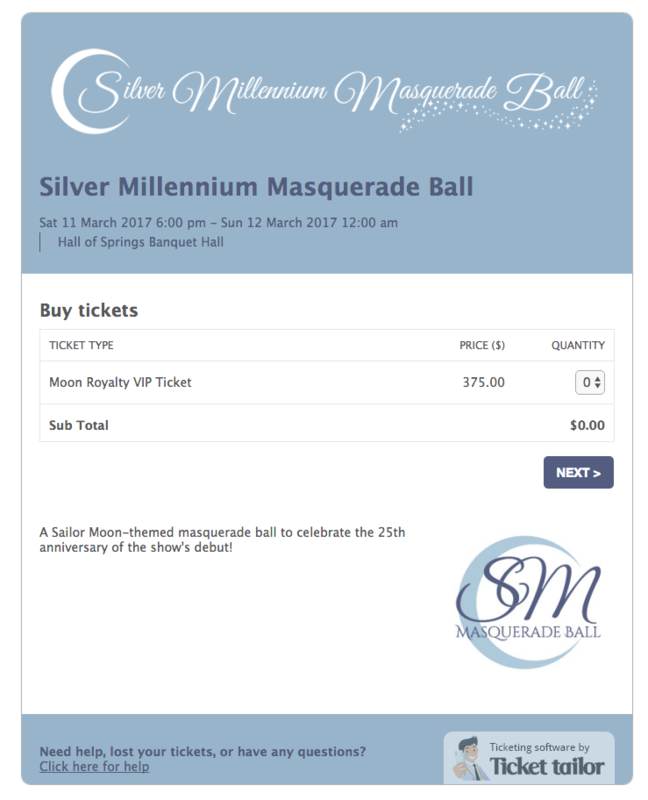 You can purchase up to FIVE tickets per order, so if your group is bigger than 5 people, definitely make sure you have two people purchasing. After you click “NEXT >” and move onto the next screen those tickets are in your checkout basket for 20 MINUTES. As long as you finish the checkout process within 20 MINUTES you don’t have to worry about the tickets being taken from you, so take your time and make sure you fill everything out correctly! There’s no timer on the page, so just make sure you’re watching the clock. The first section of this page is BILLING INFORMATION. That info has to match up with whatever payment you use to purchase the ticket. If someone else is gifting you the tickets, that’s fine, as long as this information matches their credit/debit/banking info. Also be aware that the digital tickets will go to the email address listed in this section. 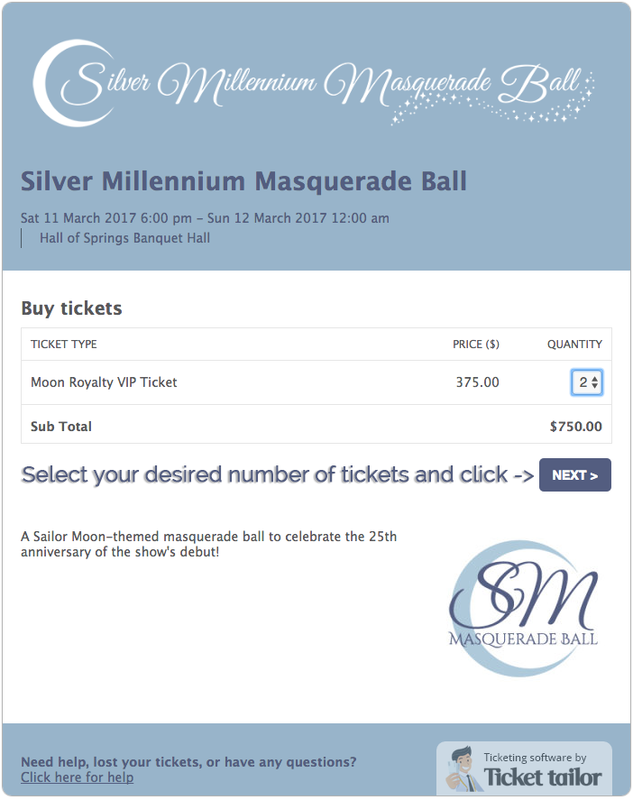 The second section corresponds to the number of tickets you’re purchasing (1 to 5 tickets) and should contain the information of the people actually attending the ball. It’s extremely important that you enter your REAL LEGAL BIRTH NAME AND BIRTHDATE. We’ll be checking ID’s upon entry against this information in order to prevent ticket scalping, so please make sure this information matches the info on the photo ID you’ll provide at check in. There is a space for a “preferred name” that will be used on any keepsakes that you can take home. The emails in the attendee section will receive a special Welcome Email that has information about hotel blocks, preferred vendors and discounts, and our special ticket-holders Facebook group. If you have any kind of dietary restrictions, don’t hesitate to mark and list them. Our caterers are capable of making sure everyone has something to eat during the evening, and we want to make sure you’re comfortable and not worried about having a tasty meal. 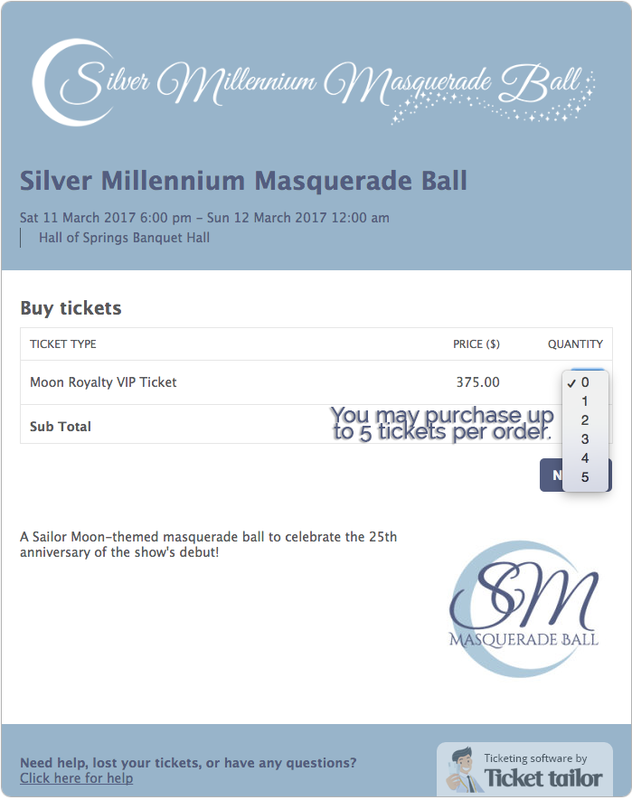 By purchasing tickets to the ball, you must comply with our Terms of Service and our Code of Conduct. 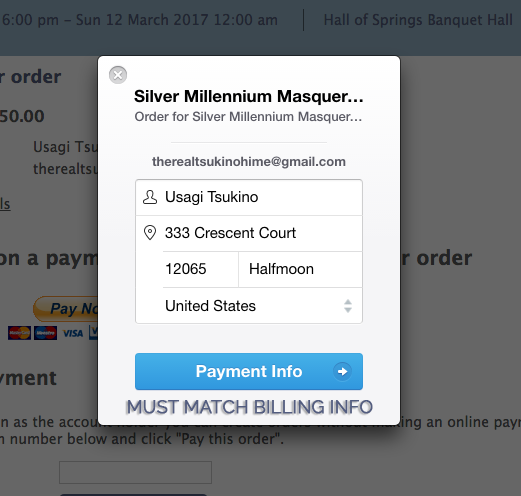 Please do take a moment to read over both as you’ll be expected to comply with these terms to attend the Masquerade. Double check all of your information and click “NEXT >”! Next is the payment page. Note that we are not charging any booking fees or taxes! Ticket prices are flat rate, so don’t worry about any additional hidden fees. We accept payment by credit or debit card (blue button) as well as PayPal (yellow button). If you’re paying by PayPal, click the yellow “Pay Now” button, and you’ll be directed to PayPal’s site to use your account to either pay directly from your bank account or your registered credit card. After you check out, you’ll be directed to your order confirmation page! 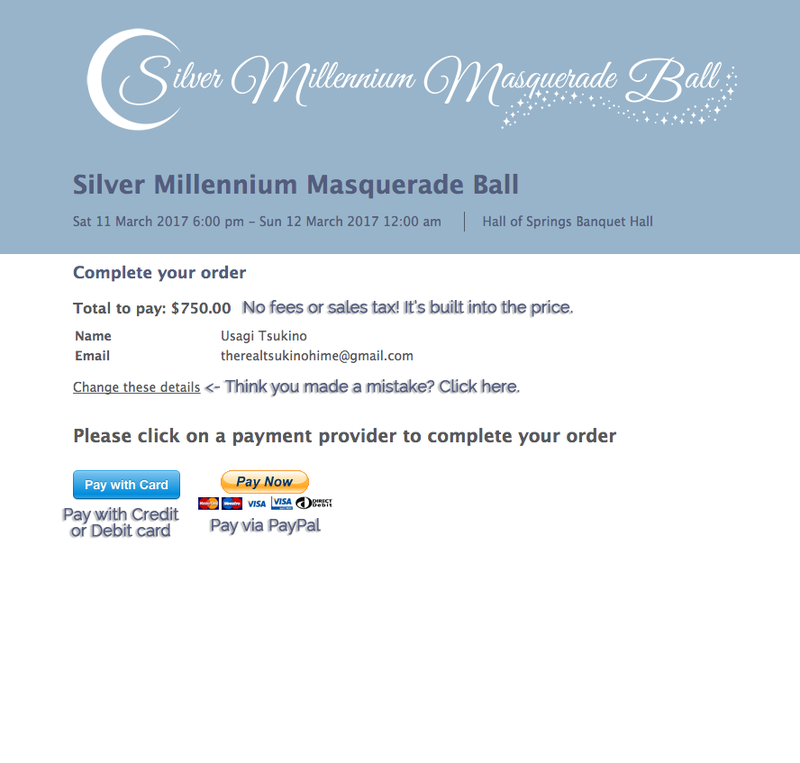 Congratulations–you’re going to the Ball!! You’ll receive your tickets to your billing email, and all attendees emails will receive the Welcome Email. If you have any further questions about this process, don’t hesitate to get in touch with us via our contact form or on our social media accounts. GOOD LUCK!! !